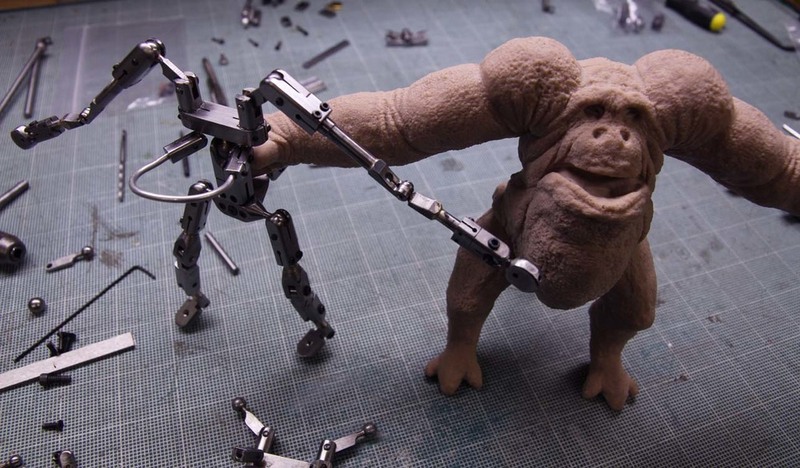 An engineer, designer, builder and animator based in the Bay Area, Brett Foxwell makes films and creatures that display a deep level of craft, workmanship, patience and obsession. After completing Fabricated, I finally allowed myself to begin dreaming up new worlds again. Fabricated was very much a story told in metal, but for my next film I began to work with wood. I became fascinated with the possibilities of a sci-fi world based on the alien forms to be found within this material that grows all around us and that we sometimes take for granted. While brainstorming this world, I came upon the concept of the WoodSwimmer. This is a deep scan of both the material of wood and the time embedded in its structure. It was a challenging technique to perfect, but once I did, I was able to shoot short sequences that move the camera through samples of hardwood, burls and branches. The result is hauntingly beautiful imagery that is both abstract and unquestionably real. In the twisting growth rings and the swirling rays, a new universe is revealed. As a short film began to build from these sequences, I collaborated with bedtimes, an animator and musician of special talents to write a song and help edit a tight visual and sonic journey through this wondrous and fascinating material. WoodSwimmer is the result. Many thanks to Colossal for the very nice post on the film. Photo prints of selected stills from the film are available at redbubble by clicking on the images below. Sept 2014 To take a break from the grueling tedium of stop-motion production, I teach myself Maya 3D, for fun. It was not, but I am fascinated by the possibilities of 3D design, animation and specifically reconstruction of existing environments. My experiments led me to the idea of SiteSeer. This is a speculative photo browser and geographic exploration tool that melds 3D reconstruction, hyperlapse, time-lapse and 2D photo/video into a navigable virtual world. The result was a video collaboration with Reuben Wu showing a short trip through this world. It was a great experience working in this new realm and the music is gear. October 2016 Fabricated has its World Premiere in New Zealand at the Show Me Shorts Film Festival, which includes a screening at Scott Base in Antarctica (yeah!). The film then screened at the Warsaw International Film Festival and the Sitges International Fantastic Film Festival. February 2016 After more than ten years of work, Fabricated is complete. It is a beautiful and intense eighteen-minute-long stop-motion animated journey with a dense, detailed soundscape and an exquisite musical score. Making this has been such an adventure and I would like to thank everyone who helped out or supported the project. I would especially like to thank the sound and color team with whom I had a wonderful collaboration: creature vocal specialist John France, composer Andrew Poole Todd, sound designers Ryan Mauk and Chris Vibberts, mixer Dan Olmsted and colorist Bradley Greer. Thank you all for your artistry, your contributions and for being exceedingly patient as I felt my way through this strange universe. March 2015 The final frame of animation for the film has been shot. It has taken me three cameras, four cities, five puppets and ten years to shoot over 27000 frames of animation to tell this story. April 2005 After several years of designing and building my hybrid creatures, I begin to shoot a short stop-motion film. I think the whole project can be finished within three years. I definitely do not know that it will take ten. You really want to go down there?